Details of the extent to which the Queen and the Prince of Wales are asked to give their consent to legislation have been published for the first time. The information, which the government initially sought to stop being revealed, shows they were consulted on changes to higher education, ID cards and paternity pay among other issues. Campaign group Republic said such a "royal veto" should be scrapped. Buckingham Palace said the process was one of "established convention". All legislation must be approved by the Head of State before it becomes law under a process known as Royal Assent - an important constitutional procedure but one largely now regarded as a formality. But a newly published document reveals the Queen and Prince Charles have specifically been asked to approve a number of bills during their parliamentary passage - ones relating to royal powers and the interests of the Crown and the Duchy of Cornwall. On issues relating to the Crown's "hereditary revenues, personal property or personal interests"
Guidance drawn up by parliamentary lawyers and setting out the "issues to be considered" regarding consent, was released after officials failed to prevent its release under Freedom of Information laws following a long-running battle. It shows that the Queen was asked to approve changes to child maintenance in 2007, national insurance in 2004 and paternity pay in 2006 because they would apply to employees of the Royal Households and the "interests of the crown" were likely to be affected. Legislation introducing tuition fees in 2004 required approval because of the Crown's historical role as a visitor of universities while a bill legalising civil partnerships needed consent because of a declaration on its validity which "would bind Her Majesty". The document also reveals that the Queen did not consent to a Private Members Bill in 1999 which proposed transferring historic formal powers to declare war - under the royal prerogative - from the Monarch to Parliament. To critics of the monarchy, the publication of this once secret document is further proof of the power the institution exercises from behind the throne. Bills as varied as the 1998 Data Protection Act and the 1996 Housing Act needed the approval of either the Queen or Prince Charles before becoming law. Those seeking an elected head of state describe this as real power in the hands of the Windsors which is an affront to democracy. Royal officials point out that no government bill has been objected to in modern times and the requesting and granting of consent is made public. Even so, the process until now hasn't registered on the public consciousness. Critics call it a royal veto which needs to be scrapped. Supporters suggest it merely amounts to royal rubber stamping. It is yet another reminder of the complex nature of the parliamentary process. Although no reason was given for this, the bill was not supported by the Labour government at the time and had no chance of becoming law anyway. The document's publication, first disclosed by the Guardian newspaper, follows a 15-month battle which saw the government initially refuse a FOI request. It was subsequently told to publish it by the Information Commissioner, and the Information Rights Tribunal later upheld the watchdog's ruling. John Kirkhope, a solicitor and academic who made the initial FOI request as part of his research into the Duchy of Cornwall, said it was "astonishing" that ministers had tried to prevent its publication. He said he had always believed that royal interventions in the legislative process were "rare". "It is a small number of bills but I find it extraordinary that they have been consulted on things like National Insurance and children's rights," he said. "There are some real oddities there." Republic, which campaigns for an elected head of state, called for "full disclosure" over the degree of royal influence over laws. "The royal veto is a serious affront to our democracy," said the organisation's spokesman Graham Smith. "This is clearly more than a formality. It is hard to believe the palace's claim that consent is only withheld on the instruction of ministers... even the threat of withholding consent could be enough for legislation to be substantially altered - or dropped." The Cabinet Office said Parliament was required to seek the consent of the Queen and the Prince of Wales for certain bills and consent had only ever been refused on ministers' advice and never for a government bill. Officials said they had decided to publish the guidance as part of the government's "drive for greater transparency". In a statement, Buckingham Palace said: "It is a long-established convention that the Queen is asked by Parliament to provide consent to those bills which parliament has decided would affect crown interests." 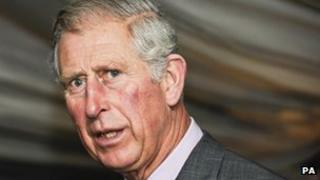 A spokesman for the Prince of Wales added: "Every instance of the prince's consent having been sought and given to legislation is a matter of public record."